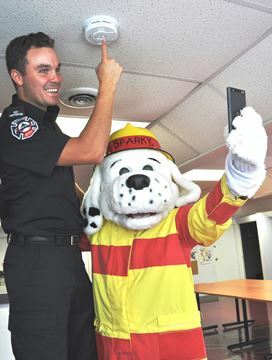 Georgina firefighter Josh Kelly takes a selfie with Sparky "Clute" in hopes Georgina residents will follow suit during Fire Prevention Week, which this year is advocating the importance of checking the expiry dates on your smoke alarms. Find out more at the Georgina Fire Department's open house this Saturday, Sept. 24. The Georgina Fire Department wants you to join the Don’t Wait, Check the Date! selfie challenge as part of this year’s theme for Fire Prevention Week Oct. 9 to 15. In support of this year’s campaign, which reminds residents to check the date on their smoke alarms, the fire department is hosting an open house at the Sutton Fire Hall located at 37 Snooks Rd. Saturday, Sept. 24 from 9 a.m. to 2 p.m. The event will include a free pancake breakfast, a free barbecue, firefighter demonstrations, interactive stations, different community partners, a bouncy castle, games and much more. “Smoke alarms don’t last forever,” Georgina fire chief Ron Jenkins said. Tweet your photo with the hashtag #checkthed8 during Fire Prevention Week and you could win a fire safety gift basket. While smoke alarms typically last 10 years, you should check yours and the manufacturer’s instructions for replacement on the back of the smoke alarm. Smoke alarms are required on every storey of your home and outside all sleeping areas. They should be tested monthly by pushing the test button on the alarm, with batteries being replaced at least once every year or when the alarm’s low battery signal begins to “chirp”. For more information, visit georgina.ca or follow The Georgina Fire Department on Twitter. More information is also available from the Office of the Fire Marshal and Emergency Management’s website at ontario.ca/firemarshal.